The updates just keep on rolling in—Custom CSS has just landed in Jetpack! You now have the ability to add to or replace your theme’s CSS right from your blog dashboard, no child theme required. To use the CSS editor, first make sure the Custom CSS panel is activated on your main Jetpack page and go to Appearance → Edit CSS. You’ll find the editing interface is fueled up with features like syntax coloring, auto-indentation, and immediate feedback on the validity of the CSS you’re writing. Revisions are saved in case you make a mistake, and invalid CSS is removed on save. In addition, we’re always working to improve the existing features in Jetpack. Jetpack Comments got a nice UI improvement in this release: when you submit a comment, there’s no more annoying fullpage load on jetpack.wordpress.com. Everything stays on your site 🙂 Also, if you’re using the pretty (a.k.a. not “official”) sharing buttons, we’ve added share counts to the Twitter, Facebook, and LinkedIn buttons. Last but not least, no release is complete without bug fixes. We fixed a bunch of bugs in the Sharing, Contact Form, Subscriptions, Carousel, and other features. For a more complete list of bug fixes, see the changelog. This entry was posted in Releases and tagged css, Custom CSS, customization, design. Bookmark the permalink. Just FYI – I’ve been loving the jetpack updates. Keep them coming! This is great! This basically removes the need to tinker with the default style.css file in your theme, which can be erased each time the theme is upgraded, and it also makes it so that it is ok if the developer of your theme didn’t include a section for custom css. Thanks a lot guys! Keep up the good work. Nice, i was looking forward to the sharing counts feature. Keep up the good work, regards. The only thing is that I would like to edit the “submitting comment” part so I can translate it to Swedish. Any way of doing that? Congrats! These two are a huge improvement! Enhancement: Comments: Submit the comment within the iframe. No more full page load to jetpack.wordpress.com. Enhancement: Sharing: Add support for ReCaptcha > Looking forward to seeing ReCaptcha supported for comments too. Nice addition Sheri! I’m curious, does the custom CSS get added inline to each page, or does it create a dynamic include? Guess I’ll go play with it and find out. Thanks much! Custom CSS adds its own tag to the header of your site, if you have the “Add my CSS to My_Theme’s CSS stylesheet” option checked. If you have the “Don’t use My_Theme’s CSS, and replace everything with my own CSS.” checked, Custom CSS removes the theme’s CSS file and only uses its own file. Thanks for info Tim. I just tried it and love how it links to a cached stylesheet rather than adding it inline on each page and cluttering up HTML like many of the commercial themes I use do. I run two blogs on wordpress.com and have been using WordPress package as base for my own website which runs on linuX. Jetpack is brilliant, it contains exactly the additional features I need for this and enables me to concentrate on content not on coding. Stability and quality of Jetpack is as good as the WordPress core itself, which I dont need to change (a lot) anymore. Thanks. Jetpack comments still don’t show up, whereas the native comments or Disqus do. Would appreciate a fix other than editing my theme. Thanks! Let us know your theme, if it’s a publicly available one maybe we can help the author (and you) update it to use the proper template tags for comments. It’s Illacrimo and hasn’t been updated in probably 5 years. I suppose my options are to migrate to a newer theme or figure out what hooks I’d need to get in here to use Jetpack comments. Thanks. Thank you for this update. Now I don’t have to update my theme’s default.css. Custom CSS is a very important and useful feature. Thank you for this release again! I checked the ‘changelog’ and found that a new set of translation was added: Bosnian, Danish, German, Finnish, Galician, Croatian, Indonesian, Macedonian, Norwegian (Bokmål), Russian, Slovak, Serbian, Swedish. Also, I found that the following translations were updated: Spanish, French, Italian, Japanese, Brazilian Portuguese, Portuguese. Please, I would like to know whether WordPress uses robot or automated translation to carry out these changes or whether WordPress works with paid or with volunteers to take care of each language pair. Are you planning on an update to be able to send excerpts in emails to subscribers instead of the complete post? We are working on an update for this, though I do not have an ETA right now for when this might be released. Hmm, replying doesn’t seem to work for me. It works without jetpack comments, but not with it. I use the Atahualpa theme (wordpress.atahualpa.com). Btw, what happens when I try to reply is that the comment is placed at the bottom like an ordinary non-reply. Oh! It worked now, I know what’s wrong. If the jetpack comment section hasn’t loaded fully, and you press reply before that, the reply is not being registrered as a reply. It’s like it hasn’t loaded the reply-link. Jetpack Contact Form stopped displaying my forms after latest update of jetpack. I have narrowed it down to a fight with the Next Scripts Social Networks Auto-Poster, however when I look in tools, I don’t get a specific error. Can you tell me what the fix is? I have auto poster disabled right now as I am running ads and I need the forms to show. But I also need to autpost to all my social media when I next post on the blog. The Next Scripts Social Networks Auto-Poster doesn’t follow the WordPress Coding Standards and results in these issues. There are a number of cases in that plugin where scripts (ex. jQuery) are added directly to the page, rather than being enqueued using proper WordPress functions. This results in clashes with other plugins (like Jetpack) that try to use the same script. Next Scripts Social Networks Auto-Poster updated a couple of days ago and resolved the issue. 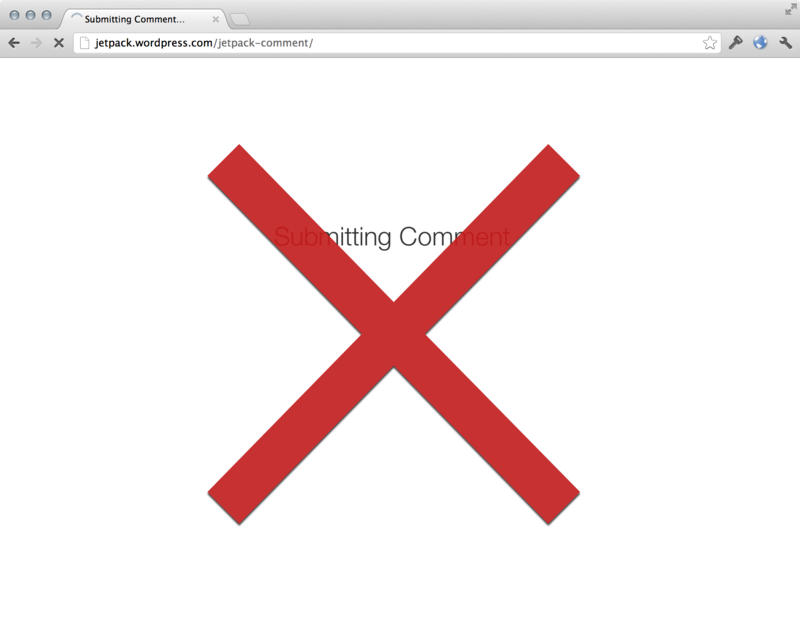 Could you email us at support@jetpack.me and let us know what exactly isn’t working? P.S. if you are trying to style the Jetpack Comments area, this will not work. How does the new CSS editor differ from using a mystyle.css file (which I’ve used to customize my theme). Is mystyle.css not a standard include file? Is it simply a convention that a number of theme developer’s use? Hmm, since I upgraded to Jetpack comments, ALL Akismet-spam is gone. Before I had like 50 spam comments a day which I had the possibility to manually remove. Now there’s none. Zero. Where have they gone? Also, it seems like 50% of all valid comments are placed in the spam folder. I have to manually mark them as non-spam and then approve them. This also happened after upgrading to Jetpack comments. Jetpack comments are really great, but I still don’t use them because the title has “Arial” as front-size. Is there any way you’ll make this more customizeable in the future? We are looking at options for this, though there is not any time frame for an update at this point. Thanks for the feedback! We think that would be nice too. 🙂 It has been added it to our roadmap as a planned future update.